Tokyo Tower is a tower for transmitting electromagnetic waves of different kinds. 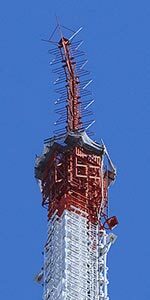 Among others all terrestrial television channels of the Tokyo region use the tower for transmission. When it was built in 1958, Japanese people were satisfied that the nation, which was totally defeated in the previous war by the Allied Powers, finally had the world tallest tower and with its 333 m height could overtake the world famous Eiffel Tower by 21m. 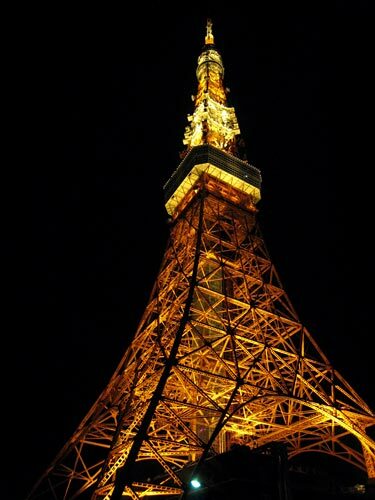 At the same time, many people felt slightly ashamed that the design of Tokyo Tower appeared similar to that of Eiffel Tower, but not as elegant as the latter. 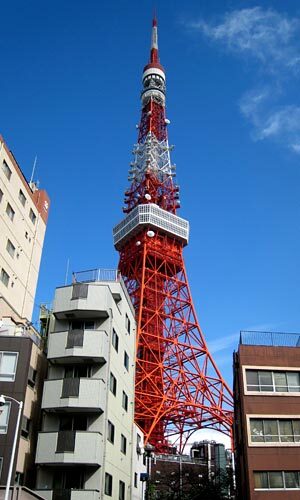 For detailed information on the Tower, please check the internet site of the Tokyo Tower. Broadcasting antennas were later attached to the Eiffel Tower and it became higher than the original state. Now, the difference between the two towers is only 9m. 50 years after its completion the tallest tower in Japan became not tall enough to satisfy the modern needs and the construction of a new and higher communication tower has begun. The new tower, Tokyo Sky Tree, will be 634 meters high and when it is ready for use, Tokyo Tower will end its role as the main communication tower in the Tokyo area. It is still not sure whether Tokyo Tower can then have some functions and continue to exist. I do not think that people would allow the Tokyo Tower be demolished, because it is certainly a representative construction in the post-war period of Japan and a symbol of the Japanese recovery from rubble. From the beginning of its existence, Tokyo Tower was a symbol of Tokyo and a popular target of attacks by monsters in SF films. Many Japanese people think that the first Godzilla destroyed the Tokyo Tower for the first time. But, this is an illusion, though many his successors destroyed the Tower in different ways. In the recent years, the nostalgia for the 30s of the Showa period (***) prevails and many things related to the Showa 30s are commercialized. Tokyo Tower is not an exception. An example is the film "Always Sanchome no Yuhi" released in 2005, which describes the life of common citizens near Tokyo Tower. Throughout the film, the audience can see in the background the progress of construction of the Tokyo Tower. Another film "Tokyo Tower: Mom and I and sometimes Dad" describes the life of a young man living together with his mother suffering from cancer. Also in this film Tokyo Tower stands in the background of human dramas. 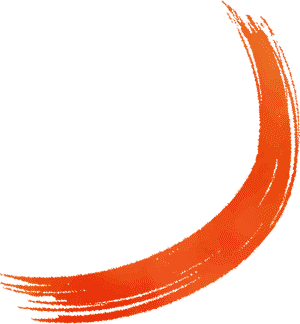 Showa is the name of the period reigned by the Emperor, who was named as Showa after his death. Showa lasted between 1926 and 1989 and the Showa 30s is from 1955 to 1964. I went up to the lower observatory just after its opening in 1958 or 1959, but I have never visited it again. This is the typical case of the most Tokyo citizens in their relations to the Tower. We see Tokyo Tower in our everyday life, but the visitors of the tower are mostly the people coming from the provincial areas, in particular schoolchildren in their study trips. 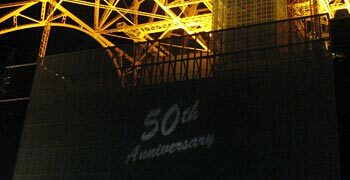 However, even for Tokyo Tower watchers, its night-time light up is a fascinating attraction. There are two prototype designs for summer and winter and special designs are used on specific occasions. Tokyo Tower is already an indispensable element of the landscape of Tokyo and I sincerely wish that the tower would survive the change of its status in 2011.